Picked up a couple of New York Strips on my way to work Saturday Morning with the intention of grilling them for dinner. Decided though to just pan fry them and make a peppercorn cream sauce. Served with sauted mushrooms, fried potatoes and steamed broccoli. 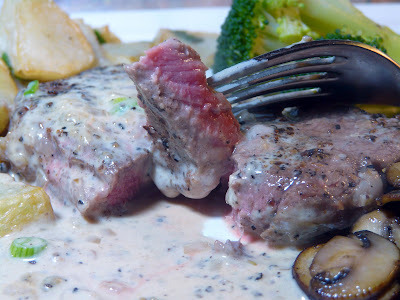 That cream sauce looks wonderful and the steaks perfectly done.